Cholesterol is a lipid that is an essential component of animal cell membranes. It allows animals to maintain cell integrity without the cell wall that plants and bacteria use for this purpose. There are many advantages to not having a rigid cell wall, such as increased mobility. In mammals, cholesterol is also used as an important component in the manufacture of hormones, digestive juices, and vitamin D. Cholesterol is actually a very good thing. In humans, cholesterol is synthesized in all cells, and it is also manufactured in large quantities in the liver. A typical person manufacturers around 1 gram of cholesterol each day. Some cholesterol is lost each day through excretion of bile into the digestive tract, but most cholesterol is recycled in the liver into new cholesterol-containing compounds. Some cholesterol is also obtained through the diet. Cholesterol has gotten a bad rap because dyslipidemia, sometimes incorrectly called high blood cholesterol, is an early sign that cardiovascular disease is beginning to develop. In a healthy person, the level of cholesterol in the body is tightly regulated. Increased dietary in take of cholesterol leads to a decrease in the synthesis of cholesterol, and vice versus. However, the aberrant metabolic processes that lead to cardiovascular disease disrupt normal regulation of blood cholesterol levels. The resulting high levels of LDL (“bad” cholesterol) in the bloodstream contribute to the development of atherosclerosis. Altering the metabolic state of the body through adopting healthier lifestyle habits can restore proper regulation of cholesterol levels. However, many individuals are unable to fully comply with healthy dietary and exercise recommendations, and they tend to resort to medications to try to restore a healthy metabolism. However, medications always come with side effects. Statins, for example, can cause digestive upset, difficulty sleeping, muscle damage, and increase the risk of developing type II diabetes. Therefore, many people would prefer a safer, more natural alternative to help control their cholesterol levels. Pterostilbene, a compound naturally synthesized by certain berries, has been shown to be quite effective in correcting dyslipidemia. 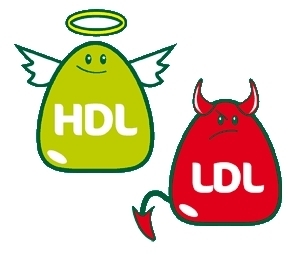 In a hamster model of dyslipidemia, oral administration of pterostilbene is able to lower LDL levels by 29% and increase HDL (“good” cholesterol) by 7% (1). The hamsters were fed a dose of pterostilbene that translates to a human dose of around 25 mg/day. A randomized controlled trial of individuals with dyslipidemia found that a twice-daily dose of 125 mg of pterostilbene was quite effective in correcting their dyslipidemia (2). It also reduced blood pressure and even produced a small amount of weight loss. Grape extract (which contains resveratrol) combined with a low dose of pterostilbene did not have any beneficial effect in this study. Studies of the effect of a combination of pterostilbene, resveratrol, quercetin, and vitamins (D and B) have also been published. Two randomized double-blind controlled trials of seniors found this cocktail had a profoundly beneficial effect on biomarkers of cardiovascular health, increasing HDL and decreasing LDL and triglyceride levels (3, 4). Both healthy seniors and seniors with dyslipidemia experienced improvements in their blood lipid profiles after only 4 weeks on the cocktail. Based on other studies and knowledge of the poor bioavailability of resveratrol, pterostilbene was almost certainly the active ingredient in the cocktail used in these latter two studies. One way that pterostilbene acts to correct dyslipidemia is by activating peroxisome proliferator-activated receptor alpha (PPARalpha). PPARalpha is a nuclear receptor that is targeted by certain medications used to lower cholesterol (e.g., fibrates). In cell culture studies pterostilbene is twice as effective as fibrate drugs in activating PPARalpha (1). Resveratrol was also studied, but it was unable to activate PPARalpha. In the cell culture studies, the activation element of PPARalpha was fused to a luciferase reporter to make it easier to measure the degree of activation. Pterostilbene activated the reporter 8-fold relative to the control, while ciprofibrate was only able to activate it 4-fold. Activation of PPARalpha in the liver down-regulates the body’s synthesis of triglycerides and cholesterol, thereby helping to restore normal levels of blood lipids. 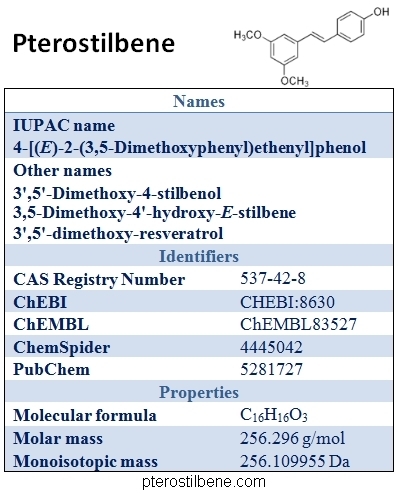 Animal studies have shown that human-equivalent doses as high as 12 grams per day of pterostilbene have no toxic effects or any apparent side effects (6). As mentioned above, a human equivalent dose of 25 mg/day of pterostilbene was effective in correcting dyslipidemia in hamsters (1). In the human clinical trial mentioned above, a much higher dose, 125 mg twice per day, was administered (2). An analysis of the safety of this dose in humans was conducted as part of the clinical trial (7). No side effects were reported by any of the participants, and biochemical analyses did not detect any apparent toxic effects on the liver or kidneys of the participants. Therefore, pterostilbene appears to be a natural, safe, and effective way to correct dyslipidemia. (1) J Agric Food Chem. 2005 May 4;53(9):3403-7. (2) Evid Based Complement Alternat Med. 2014;2014:459165. doi: 10.1155/2014/459165. Epub 2014 Jun 25. (3) J Clin Exp Cardiolog. 2013 Mar 2;4(3). pii: 238. (4) J Clin Exp Cardiolog. 2012 Jun 7;S5:8. (5) BMC Med Genomics. 2008 Mar 20;1:7. doi: 10.1186/1755-8794-1-7. (6) J Agric Food Chem. 2009 Apr 22;57(8):3180-6. doi: 10.1021/jf803579e. (7) J Toxicol. 2013;2013:463595. doi: 10.1155/2013/463595. Epub 2013 Feb 4.